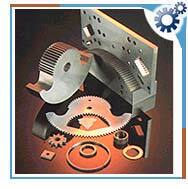 Involute gears have a tooth shape that is tolerant of variations in the distance between the axes, to ensure smooth running of the gears. The velocity ratio of the gears does not depend on the exact spacing of the axes, but is fixed by the number of teeth or by pitch diameters. Increasing the distance above its theoretical value makes the gears run easier, since the clearances are larger. This also increases the backlash. Rack type cutters generate involute gears. On an involute gear tooth, the contact point starts closer to one gear, and as the gear spins, the contact point moves away from that gear and towards the other. The pitch diameter is the effective contact diameter. As the gear turns, the contact point slides up onto the thicker part of the top gear tooth. Thus, pushes the top gear ahead. As the teeth continues to rotate, the contact point moves further away going outside the pitch diameter. Then the contact point starts to slide onto the skinny part of the bottom tooth, subtracting a little bit of velocity from the top gear to compensate for the increased diameter of contact. Thus, the involute gear tooth produces a constant ratio of rotational speed. Involute spur gears have the invaluable ability of providing conjugate action when the gears' center distance is varied either deliberately or involuntarily due to manufacturing or mounting errors.